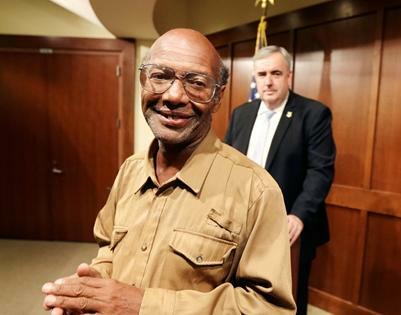 *Honesty really paid off for a homeless man in Boston who turned in a backpack worth nearly $42,000 earlier this week. Since his good deed, an online fundraiser had raised more than $92,000 for Glen James by early Thursday, and brought in offers from strangers who want to help the Good Samaritan by donating computers and offering health care services to him. “I like to make people happy. That’s what makes me happy,” said Ethan Whittington, 27, of Midlothian, Va., who started the effort for James. Whittington has never met James, but felt compelled to start a fundraising campaign for him after reading about him. Whittington, an accounts manager for a marketing firm, set up the fundraiser on the online donation site GoFundMe on Tuesday expecting “maybe a couple hundred bucks over the next couple of weeks,” but set his goal at $50,000. Strangers have raised nearly half of a $50,000 goal, to reward a homeless man who found and returned a sack full of cash. WHDH’s Ryan Schulteis reports. Read/learn MORE at NBC News.